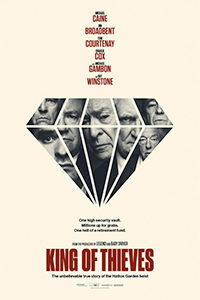 King of Thieves harbors no illusions about ensnaring the viewer’s nostalgia for the British gangster films that inspired it, nor does it hesitate to shower affection onto its cast. Headlined by Michael Caine, the film boasts an ensemble of old-timers together for one last crack at the genre that helped solidify their fame and talent. Jim Broadbent, Tom Courtenay, Michael Gambon, Paul Whitehouse, and Ray Winstone populate a scenario about a bunch of gray-haired former thieves who team-up for the proverbial “one last job.” Going back to On Golden Pond (1981), audiences love to watch the aged versions of their favorite movie stars nab the limelight again, and the setup here recalls the recent Going in Style (2017), in which Caine, Morgan Freeman, and Alan Arkin decide to rob a bank because of their failing pension. But director James Marsh, whose documentary Man on Wire (2008) remains a superb heist film, spend far too little time on the true-crime elements of the story and far too much time indulging in unabashed fandom for his stars. The caper recounts the real-life burglary in 2015 that took £14 million from safe deposit boxes in Hatton Garden, the commercial district of London populated by jewelers and diamond merchants. Joe Penhall based his screenplay on two articles: Duncan Campbell’s piece in The Guardian called “One last job: the inside story of the Hatton Garden Heist;” and another in Vanity Fair titled, “How a ragtag gang of retirees pulled off the biggest jewel heist in British history,” by Mark Seal. 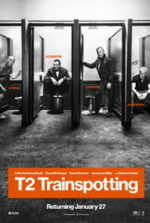 The veracity of the burglary and its details are overshadowed by the film necessitating a veritable Ocean’s Elderlies scenario, which is more interested in watching these actors do their thing, talk about the various physical maladies that come with age, and joke about the unreliability of their bowels. 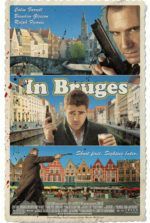 After the death of his wife, retired thief Brian Reader (Caine) is approached by Basil (Charlie Cox), an introverted security systems expert with a plan to rob a vault of safe deposit boxes. Brian, who prattles on about “F for flawless” diamonds—bringing to mind Caine’s other old-age jewel heist movie, Flawless (2008)—enlists a band of his former cohorts: John (Courtenay), an explosives expert with hearing problems; Carl (Whitehouse), a tech guy who’d prefer to retire to his garden; Broadbent is cast against type as Terry, the resident bully; and the youngest of them, the snarling hotshot Danny Jones (Winstone). They concoct a scheme involving security codes, drills, and hydraulic lifts, and all the while Benjamin Wallfisch’s jazzy score keeps things light and uninvolving. On the periphery, Michael Gambon plays a doddering, absent-minded fence who will move the jewels. Once they take the score, however, King of Thieves has an odd shift in tone from a fun-loving lark into a dark thriller, as Terry and Danny team up to strong-arm the others out of their cut. Not that things get bloody or violent, but a feeling of danger takes over. There’s also a surprising number of off-color insults, including racial and homophobic remarks from Terry and the others, suggesting these geezers aren’t the merry band of criminals they seem to be. The tonal shift into uglier territory doesn’t last, as the final scene attempts to restore the rompish goodwill from earlier in the film. Marsh can’t seem to decide if he wants to make Ocean’s Eleven (2001) or Get Carter (1972)—two crime films that, tonally, are worlds apart and don’t easily intermingle. Penhall’s script is less to blame than the music and editing, which hope to make everything much livelier than it is. Indeed, Marsh and his team of editors create a metatext of British gangster films, at once proceeding with the story at hand while frequently inserting brief scenes from earlier entries in the genre. It’s an odd and post-modern choice, and never less than completely distracting. Over the opening titles, or in the midst of a montage in which Brian’s group prepares for the burglary, the film cuts to moments from other titles starring this cast—some of them not even in the gangster genre: Caine in The Italian Job (1969), Broadbent in The Hit (1984), Winstone in Scum (1979), Courtenay in Billy Liar (1963), and so forth. Marsh seems to have nostalgia not only for the genre but his cast of living legends. King of Thieves rests on nostalgia in one form or another instead of embracing the fascinating real-world burglary. And while watching this cast, even in a mediocre film, may offer a few pleasures, the result feels hollow and unworthy of such impressive onscreen talent.